A strong enough start and it's always good to remain unbeaten. 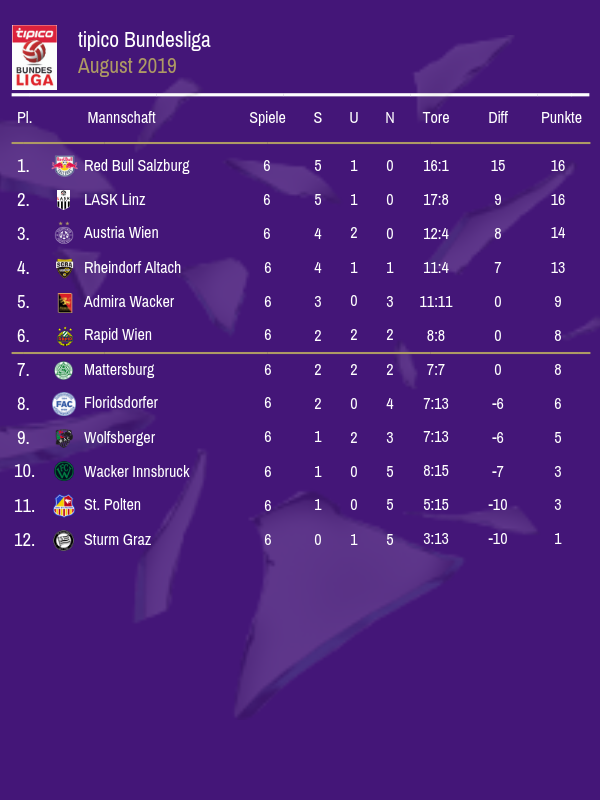 Trust Salzburg to win five of their six and remain unbeaten though. 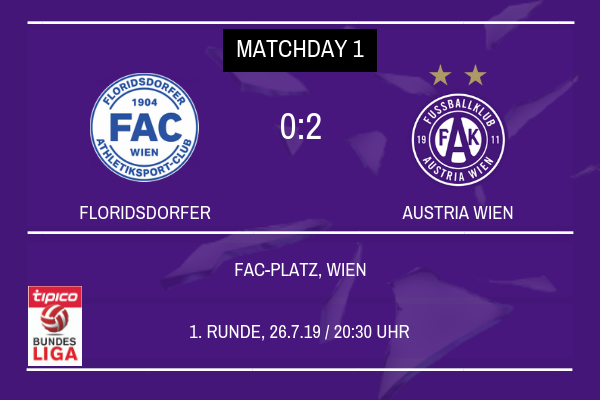 With several members of his Die Vielchen squad away on international duty for the next two week, Austria Wien manager Christopher Steegmann had the chance to catch up with fk-austria.at about his team’s start to the season. Die Vielchen currently sit 3rd in the Bundesliga table after six games, having won four and drawn two of their opening half a dozen games, having played some excellent football along the way in a run that included a thumping 4-1 victory over bitter rivals Rapid Wien. In this interview, Steegmann spoke about his teams great start to the league campaign, Die Vielchen’s Champions League Qualification defeat to Zenit and the Group Stage draw for the Europa League and his thoughts on his teams chances. Christopher, thank you for joining us today. Training is all done for the day, you must be thrilled with how well the team have returned from their break and started their new league campaign? You’re welcome! Yeah I’m very pleased. We’ve started the season really well. The lads have worked extremely hard over the course of pre-season to get themselves back into a condition where they are fit and prepared to go for the long season ahead. We’ve picked up some really good results so far this season, admittedly a couple haven’t quite gone our way but we’ve still had a start to the season that we can be really proud of. We’ve won more games than we had at this stage last season and turned some of those draws into wins and things are looking really good moving forward into the busiest part of our season so far. 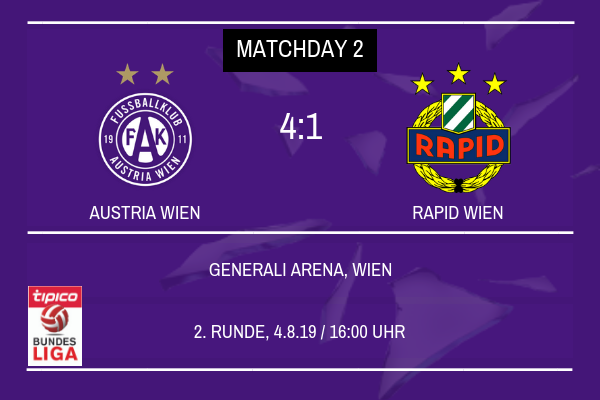 The 4-1 victory over Rapid Wien was a very sweet moment for the fans and everyone associated with this club, has that been the stand out moment of this campaign so far? I don’t think you’d believe me even if I said no! And I’m sure the fans would also disagree with me. Of course it has been the stand out moment of the campaign so far, along with the 3-2 victory over Zenit although in context the derby win has to take the number 1 spot. To beat your rivals that comfortably was fantastic and we played some extremely good football and dominated the tie and really hit them hard. They’ve not started the season well at all so to compound the misery was excellent and I’m really proud of the team. 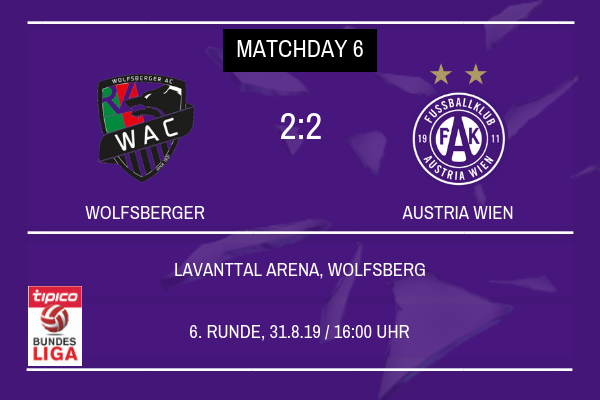 The 2-2 draw with Wolfsberger has set the team back a little bit in the title race, are you worried that your team struggled to see the game out from that winning position? It is frustrating that we were unable to see out the game having taken the lead and although it was concerning, I am not overly concerned that it is going to set a trend for the rest of the season. 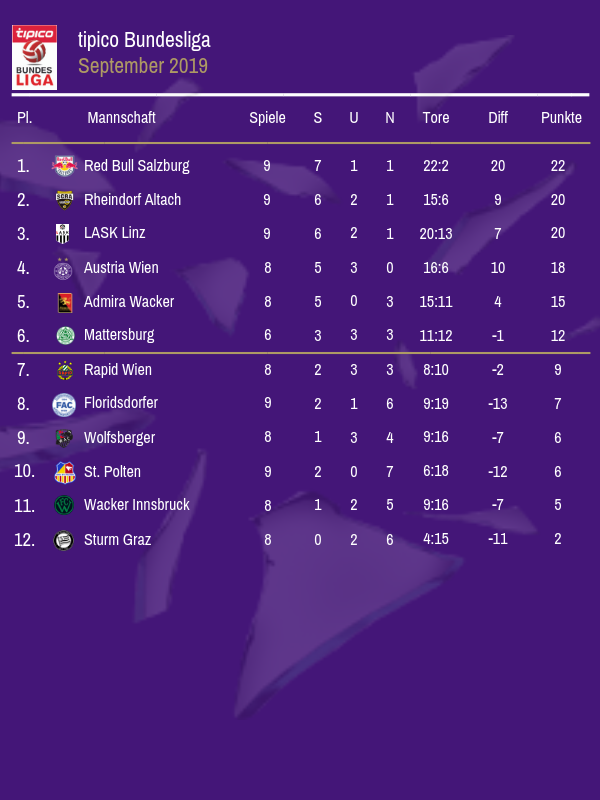 The boys have the quality and the ability to make sure it doesn’t happen again and I am sure that the Wolfsberger result will be an anomaly rather than the pattern. They did well to fight back into the game. We’ll also get the chance to catch Salzburg and the other teams that have started the season really well so I am definitely not overly concerned about the points that we dropped. You must be desperate to win the Bundesliga this season, if not just so that you get another shot at Champions League football next season and what you would hope is an easier route to the Group Stages? We want to win the Bundesliga every season and after we let it slip last season and what happened last time out happened the desire amongst the squad to win the title this year is even great and hopefully we can take that final step this season and pick up the trophy we want. The added bonus would be the easier route into the Group Stages of the Champions League without a doubt but I think we’re good enough to challenge any team we come up against in any of the Qualifying Stages of the competition and I think we proved that against Zenit this season. Were you disappointed that the team were unable to see out the 3-2 victory and aggregate lead that you managed to secure after the first leg against Zenit? Yes absolutely, but Zenit showed in that second leg the quality they have and how good their team was. They had a team that has played European football regularly, season in, season out for I don’t know how long and combined with the money that they have available to them, they’re able to sign a calibre of player that we aren’t able to. However we gave them a very tough test and they’ll definitely have known that they played a game against us and we pushed them as far as we could. We’ll be back, you have my word. You will of course be playing in the Europa League this season, we’ll come to the Group Stage draw in a moment, but how seriously will you be taking the competition this season? We’re going to be putting as much effort into the Europa League as possible. We worked extremely hard last season to get ourselves back into European football having missed out on any European football last season, so we’re going to be taking it very seriously. We’re going to go into every game we play in the Europa League with the aim of winning it and trying to push the team we’re playing as far as we can. I know if we do that, and we play as well as can do, we can pick up results and cause a bit of a shock with how well we do. You were obviously drawn into Group H in the Europa League along with FC Basel, Olympiakos and Standard Liege. Do you think you could have had a harder draw? You did avoid the likes of Chelsea and Borussia Dortmund. Yeah you’re right, we have avoided some of the huge teams in this draw like Dortmund, Chelsea, Sevilla etc. It’s always a tough one with this kind of situation, you want to draw the big teams just to give the fans an adventure and a chance to visit places like Stamford Bridge or Signal Iduna Park, but then you also want a group where you really fancy your chances. That being said FC Basel and Olympiakos are two huge teams that cause problems for a lot of teams they play in the Champions League and have good records against some of Europe’s biggest teams so we know they will provide us with a real test. Our group is difficult and it won’t be easy, but we’re confident that we can progress, because we believe in ourselves and I know we play some very good football when we really get going. Do you believe in your squad’s ability to manage three competitions with what you would hope is a title bid in the Bundesliga to come, an OFB-Cup campaign and now the extra demands of the Europa League? Yes absolutely. This is a great group of lads with a lot of belief in themselves and a lot of ability. We’re fortunate that the cup games are spread out over the course of the season or at least they will be if we beat Ried in the Second Round. The Europa League does provide a little bit more of a fitness problem but that’s what you want really, if we didn’t have European football we’d be disappointed and ultimately we’re really looking forward to the six games we’ve got to play in the competition. Perhaps the biggest story for the club after the closing of the transfer window was that you managed to retain the signature of Patrick Pentz, how big a deal for this team will that be? Absolutely huge. Patrick is one of the top goalkeepers in this league and is one of the hottest goalkeeping prospects in Europe right now if you ask me. He is an integral part of this team and one that will save us many points in the coming season. When we want to achieve the things we do this year, having a player of Patrick’s quality on goal could be crucial to our chances. What would be the perfect season for you and this team? You’ve had a season in charge now to get the team accustomed to your playing style and philosophy, so what can Die Vielchen fans expect for the rest of the season? Winning all three trophies we’re playing for surely? Seriously though, we want to make sure we improve on last season, hopefully by winning the Bundesliga. That was the one step we failed to take last year and we’re desperate to make sure we can do it this year. 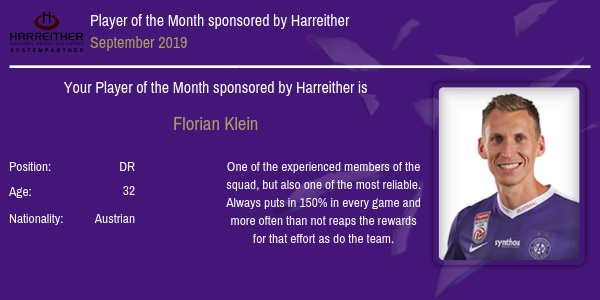 Yes I’ve had a season here now but we’re already showing signs of improvement on last season and hopefully we can take those steps we failed to take last season and hopefully win the Bundesliga whilst also challenging for the OFB-Cup and putting together a run in the Europa League. Well, that concludes this interview Christopher, thank you for taking the time to speak to us! Okay cool, thank you very much, it was my pleasure! ScottT: Yeah a strong start just a pity we couldn’t quite keep the pace with Salzburg! It is good to see the manager has ambitions to win every competition, which would be a remarkable achievement for the club. An unfortunate set back in the league which sees you two points adrift of top spot but still unbeaten, still in a strong position. This is your year. Go big or go home. Love the ambition! A Die Vielchen side with several changes made by Christopher Steegmann was able to come away from the Georgios Karaiskakis on Thursday evening with a point after a thrilling 3-3 draw at the 44 time Greek Champions. Bright Edomwonyi was the hero for Die Vielchen with the forward scoring his first goals for the team since 3-2 victory over Zenit St. Petersburg to secure a valuable point on Matchday 1 of the campaign. Elsewhere in Group H, FC Basel thumped Standard Liege by a huge 6-0 scoreline at St. Jakobs Park as the Swiss side laid out their credentials and hopes of winning the group and securing a place in the Knockout Stages of the competition. 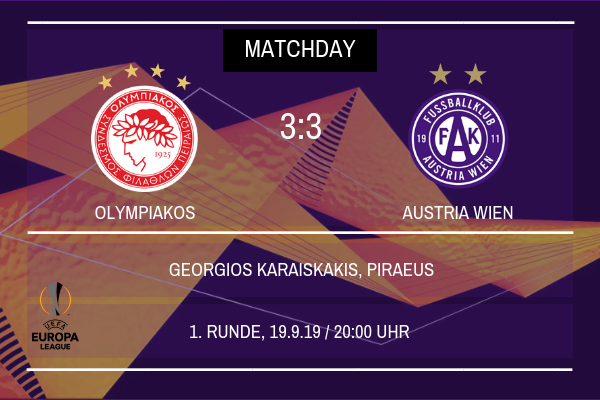 As Die Vielchen fans have become accustomed to, Christopher Steegmann sent his Austria Wien team out to attack Olympiakos and briefly in the opening 10 minutes it worked, with the Greek side struggling to cope with the pressing from their visitors. However, Die Vielchen were leaving themselves vulnerable on the counter attack and after 12 minutes the Greek side were able to hit Austria on the break with Mathieu Valbuena sweeping home a fast move from Olympiakos to make it 1-0. Die Vielchen changed their approach slightly in response to the opening goal with Austria looking to hit the hosts on the break instead and the change of plan worked for Steegmann and his team. In the 25th minute, Austria hit the hosts back, with Bright Edomwonyi being slipped through on goal by Marcel Canadi with the young Austrian midfielder sliding the Nigerian forward with an excellent through ball. Just two minutes later, Die Vielchen were in front as David Cancola received the ball on the edge of the penalty area before firing a tame effort at goal, which took a wicked deflection off Olympiakos defender Bjorn Engels, and flew into the goal past Walke in the Greek sides goal making it 2-1 and giving Austria Wien fans a dream of picking up three points on Matchday 1. However with five minutes left until half time, the home side were level again as Miguel Angel Guerrero fired a powerful effort past Patrick Pentz as the scores were levelled at 2-2 going into the half time break. 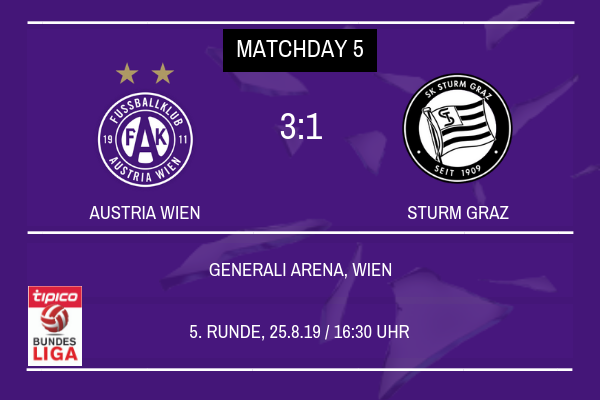 Guerrero and Edomwonyi both scored headers in the second half, as both sides pressed for the win that would keep the pace at the top of Group H, however Austria Wien fans, having witnessed their team have 25 shots on goal over the course of the 90 minutes will be disappointed that their team were unable to take all three points from the first game of their Europa League campaign. Meanwhile Olympiakos will be frustrated that twice they threw away a valuable lead that would have given their chances of progressing a huge boost. 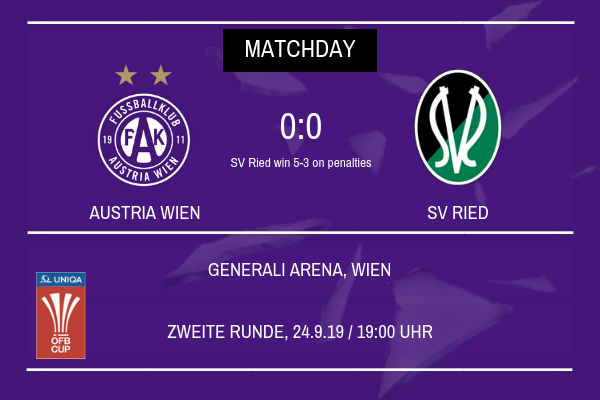 Meanwhile next up for Die Vielchen is the second round fixture in the OFB-Cup against Erste Liga side SV Reid at the Generali Arena next Tuesday. 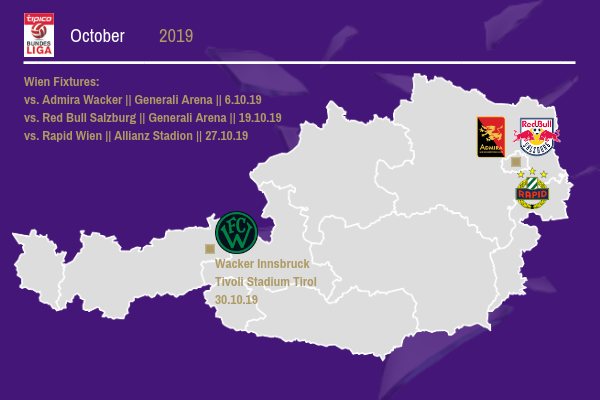 Austria won’t return to European action until October 3rd, when top of the group FC Basel visit the Generali Arena, whilst Olympiakos will visit Standard Liege on the same date on Matchday 2. Justice: In the context of Austrian football we’re a huge club so it’s what we should be aiming for season in season out. An unfortunate setback but one we can definitely recover from! Quite the way to announce yourself in continental football! A draw away to (arguably) your toughest opponents in the group is a good way to start. Plenty of positives to take from it! Geez, you have taken this all to another level since I have been gone... very very good mate! A very exciting start to the Europa League campaign! 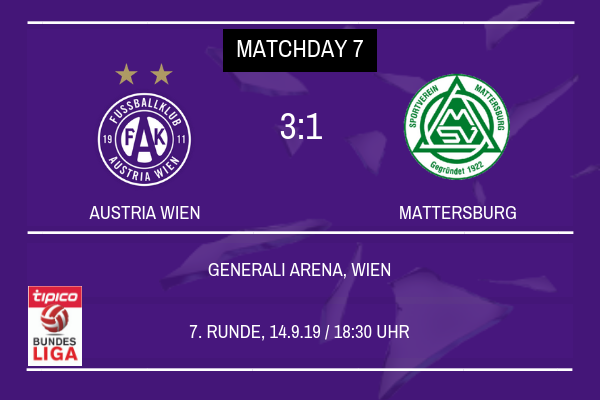 Austria Wien’s dreams of winning the OFB-Cup for the first time since 2009 were ended in the Second Round today as Erste Liga side SV Ried took advantage of Die Vielchen’s inability to put the ball in the back of the net and eliminated Christopher Steegmann’s side on penalties. With Ried taking the first spot kick, it was club captain Alexander Grunwald that missed the deciding penalty that sent the second tier side through ahead of the home side and now Austria Wien will have to turn their attentions solely to mounting a title challenge for the Bundesliga Crown and their fledgling Europa League campaign. Steegmann did rotate his side for this second round tie, most notably his forward line with Dominik Fitz, Marcel Canadi, Blessing Eleke and Kevin Friesenbichler starting in place of the usual forward line of Lucas Venuto, Alexander Grunwald, Dominik Prokop and Bright Edomwonyi, and their lack of match practice and fluidity together proved costly for Die Vielchen. 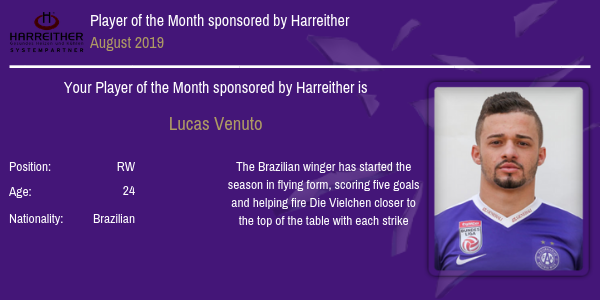 Without Kevin Friesenbichler having played over eight hours of football since his last competitive goal for Austria Wien, it was always going to be a gamble for Steegmann to utilise the forward from the start, especially off the back of Edomwonyi’s double against Olympiakos in the Europa League last week. The hosts had an onslaught of chances but Kriedl held strong in the Ried goal and with their backs to the wall, the visitors were able to fend off Die Vielchen’s advances and over the course of the 120 minutes take the game into the dreaded penalty shootout. With both sides utilising the option of an extra substitute in extra time, Die Vielchen brought on Bright Edomwonyi, who was also guilty of missing chances that on another day he would have taken and the tension in the Generali Arena rose when the referee blew his whistle to begin the shootout. Thomas Reifeltshammer scored the opening spot kick before Grunwald, whose record from the spot has been shaky, sent his spot kick straight down the middle into the fists of Kriedl. With Patrick Schmidt, Flavio, Manuel Kerhe, all scoring there penalties, it was left to Andreas Lienhart to slot his spot kick away to make it 5-3 in the shootout and send the travelling Ried fans wild as they secured their place in the Third Round Draw. 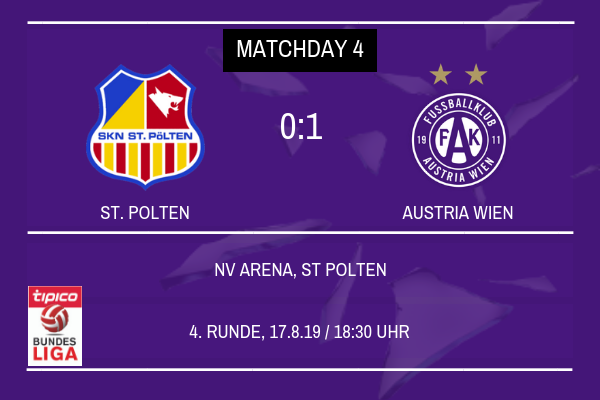 Like the manager mentioned, Austria Wien will now turn their attentions to their ongoing pursuit of the Bundesliga title and their Europa League campaign. 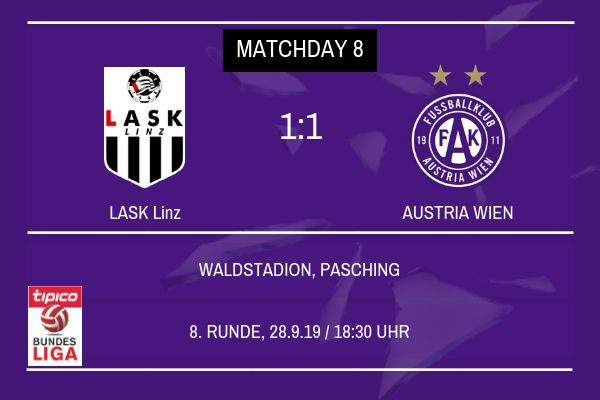 Die Vielchen face LASK Linz, who have started the season strongly and occupy 3rd in the table with 19 points from their 8 games at the Waldstadion on Saturday with Christopher Steegmann’s team looking to move above Linz and into the Champions League places in the Bundesliga. Justice: Yeah it’s a huge point and a great way to start the campaign, offensively so more than defensively so but a point against Olympiakos is a point we’ll take! ScottT: A great start, a point goes down very nicely! Not the result you were hoping and probably expecting at all. Congratulations on winning SOTM mate! Tough setback. Accept SOTM as a well-earned consolation prize! 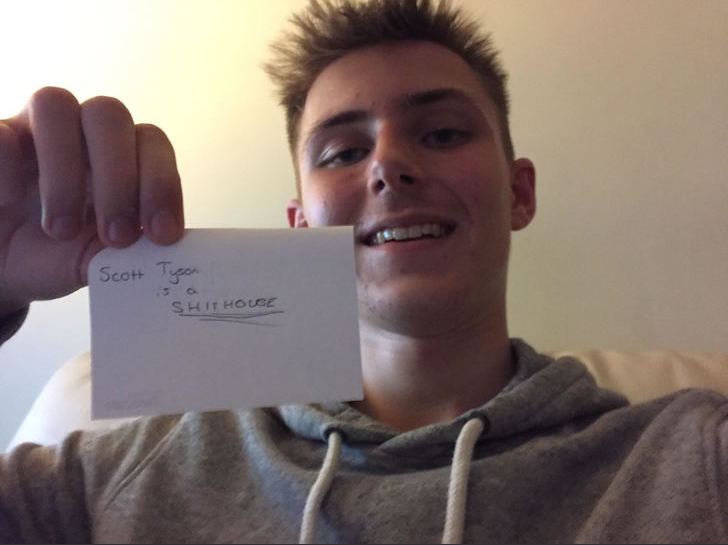 ScottT: No not at all, bitterly disappointing and frustrating! tenthreeleader: Tough result but the consolation prize is amazing! A bit of a stuttering month, but you're still unbeaten in the league and not too far behind the leading pack. I have full confidence that you'll be in contention very soon.